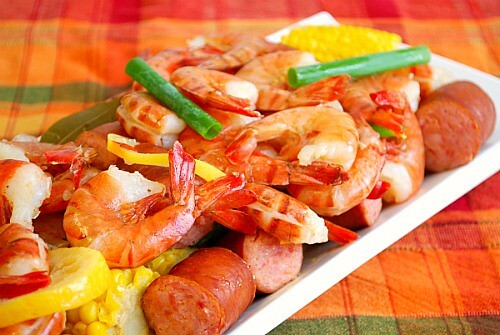 Article first published as Low Country Shrimp Boil on Blogcritics. Fill a large pot with enough water to cover all of the ingredients. Add the old bay seasoning, bay leaves and lemon slices and bring to a boil. When the water boils, add the potatoes and sausage. Cook on medium heat for 20 minutes. Add corn and cook for an additional 10 minutes. Add shrimp and cook for no more than 3 minutes. Drain and serve with warm bread. Deelicious and such a fun thing to do for a party. Spread that butcher paper on the table, drain well and just pour out on the table... add a few cold ones (beer for me, root beer for the wee ones) and it's an event! I'm a sucker for Southwestern cuisine. I do like to experiment and try new things, however. I'll have to give this a try! This sounds wonderful! I love all the different foods combined here.